It’s wild to be sitting down to share such a personal story of finally meeting Otis. It’s been 10 days since we welcomed him into out arms and I can still remember the whole process vividly. I have always found it so helpful to read about others experiences so I am happy to share mine with you all today. 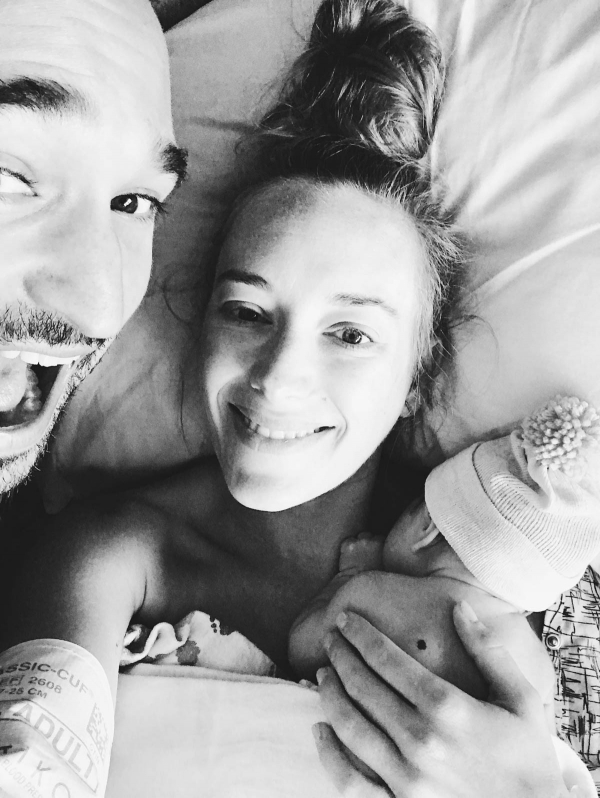 It’s taken me awhile to actually get to writing this post and my content has been at a stand still on the blog so apologies for my absence but we have been soaking up every second with our little one. Early that day, we headed to my 39 week doctors appointment for a cervix check. I was excited to see if we had made any progress from our last appointment. After seeing the doctor, we had great news, I was 90% effaced and a tight 2cm dilated. I had lost my mucus plug (I know, TMI) the week before so I knew things were moving in the right direction. The waiting game was on. Pretty early on my doctor was convinced that we would likely meet our baby early between 38.5 and 39.5 weeks. Ever since she gave us that prediction, it started to creep in my mind and I started to get anxious in anticipation of wondering will my water break?? When will I know my contractions are starting? I remember saying that week to Blake that I was disappointed we hadn’t seen any action yet since the doctor was so convinced we would deliver early. We spent the rest of the day running some errands and decided to do a little casual date night at our neighborhood gastropub. While at dinner we planned some fun things to do over the weekend, made some dinner reservations, and planned some beach time to catch up on our kindle reading. Needless to say… we would not be keeping any of those plans. I did not really experience many Braxton hicks contractions and only had some occasional pain moments, which looking back, were Braxton hicks and they just were not super intense so I didn’t think much of them but my body prepping and stretching for baby to come. I had wondered, “How will I know I am in labor?? What will it feel like? Will it start strong? Will my water break?” and oh man. When you are in labor… you will know. I have been pretty lucky throughout my second and third trimester I was able to sleep pretty well (also with the help of unisom prescribed by my doctor). I of course would wake up to pee all the time, but this time, I woke up at 1:30 am and I knew this was different. I woke up with pain that felt like cramping and I thought to myself, this must be contractions. So I remember what my birth classes said that I should empty my bladder, and drink a bunch of water and walk around to see if I felt better. I went to pee, chugged some water and got back into bed. Meanwhile, the pains came back and they kept me awake. I pulled out my phone and started to log my contractions into my Ovia app. Blake was sleeping and I didn’t want to wake him up for a false alarm. So for the rest of the night, I was chugging water, getting up to pee, sitting up in bed from the pain and tracking my contraction. My doctor wanted me to follow the 5-1-1 rule. Meaning, not to head to the hospital until my contractions were 5 minutes apart for about an hour. She was not so concerned about the length of the contractions but wanted me to make sure they were powerful before coming in. I couldn’t sleep and each contraction would jolt me out of bed. It’s hard to describe what a contraction feels like but it’s basically a tightening feeling in your uterus that feels like period cramps ON STEROIDS. My contractions were all lasting about 1 minute or more long and were fluctuating between 4 minutes and 12 minutes. They were all over the map. Eventually around 6am I woke Blake up to let him know I was having consistent contractions. I had my biweekly appointment with fetal diagnostics at 9am on Friday so we figured that if I was still having contractions and if they became more regular, we would just go to the hospital. I started getting REALLY nervous that it might be time to actually head to the hospital. My contractions started to get closer together until they were ranging from 5-6 minutes closer to 9am so we decided to pack up and head to the hospital. I was sure that after 8 hours of having contractions, things must have been progressing and I didn’t want to risk getting to the hospital too late. I took a quick shower, got myself dressed while Blake grabbed all our bags and we were on our way. We checked in with OB triage where they evaluate you to see if you are in active labor. I did notice that my contraction times seemed to lengthen a little by the time we got to the hospital but I was just so happy to be there and get checked out. We sat in the waiting room while they got a room ready for us and I was just sitting there exhausted from not being able to sleep all night. We finally got into the room and she hooked me up to fetal monitors and did a cervix check. I was still at 90% effaced and at a solid 2cm dilated. I was devastated. I looked at Blake and we both knew. They were going to send us home. In the interest of being thorough, the nurse had us walk around the floor for a full 30 minutes to see if it would set anything into quicker motion for us but nothing changed. She advised us to come back when the contractions were stronger. Stronger so I would not be able to talk or walk through them. I was so embarrassed. I told her how silly I felt for coming in and the nurse assured me that this happens so often. It’s so hard when you have never been through the process and don’t know that magic time to go in when your so nervous and just want to make all the right decisions for your baby. We headed back home and we were now on high alert. This day was one of the most challenging days to date. Of my life. As we sat at home, we started googling how long we could be in early labor and the answers were… terrifying. There were people who were in early labor for days. Honestly Dr. Google is never the best idea but we couldn’t help it. My contractions continued consistently from 1:30 am and never stopped. All lasting around a minute and all day between 4 minutes and 12 minutes. I couldn’t rest or sleep as they were keeping me up and I was just so uncomfortable. I continued to chug my water and get up and walk around the house. I wasn’t even hungry and skipped breakfast since I had zero appetite. I finally forced myself to eat a grilled cheese sandwich between contractions. I tried so hard to get some rest but my body was just not having it. Blake and I hung out all day on the couch and watched the Office to try to get my mind off of things. For breathing, all the lamaze breathing was just not for me. It made me feel way too out of breath and it just didn’t feel natural for me personally. For me, yoga breathing and deep cleansing breaths were the only way for me to focus and get through the contractions. The day was filled with alot of frustration on both my end and Blake’s end. We were both so frustrated to have been sent away from the hospital and not know when there would be an end in sight to this day of contractions. I was completely miserable. The idea of being in this state for days… made me feel even more miserable. The day was extremely challenging both mentally and physically. Early evening started to roll around and Blake was asking if I noticed the contractions getting any stronger. My response is that I just didn’t know. I was second guessing myself and didn’t want to be unsure. Blake eventually ordered some dinner for himself but I was just so miserable and still had no appetite. 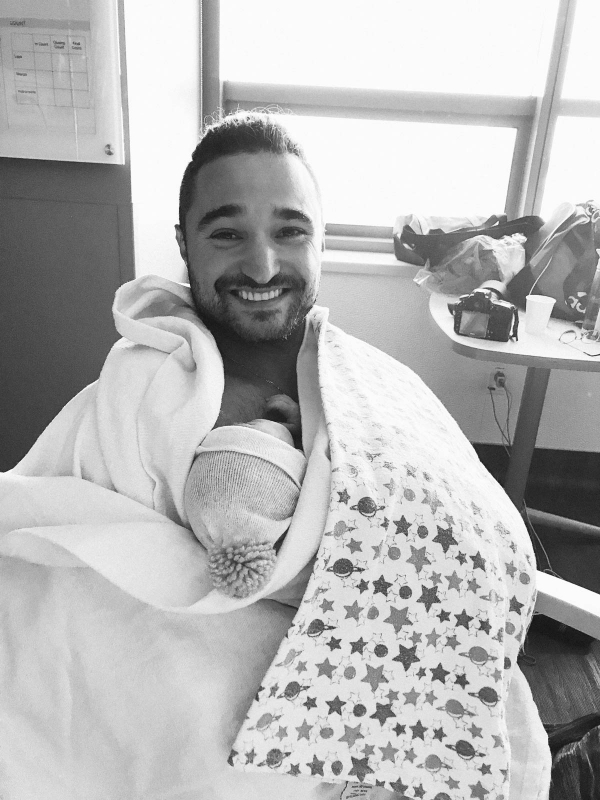 Before I knew it, every contraction had me standing up, hovering around my living room, leaning up against any piece of furniture I was near and swaying on all fours to get any relief or good position during contractions. Blake kept reminding me to breath through them because you just easily forget to focus on that. It around 11pm and Blake looked at me with concern and said, “How far apart are your contractions?? 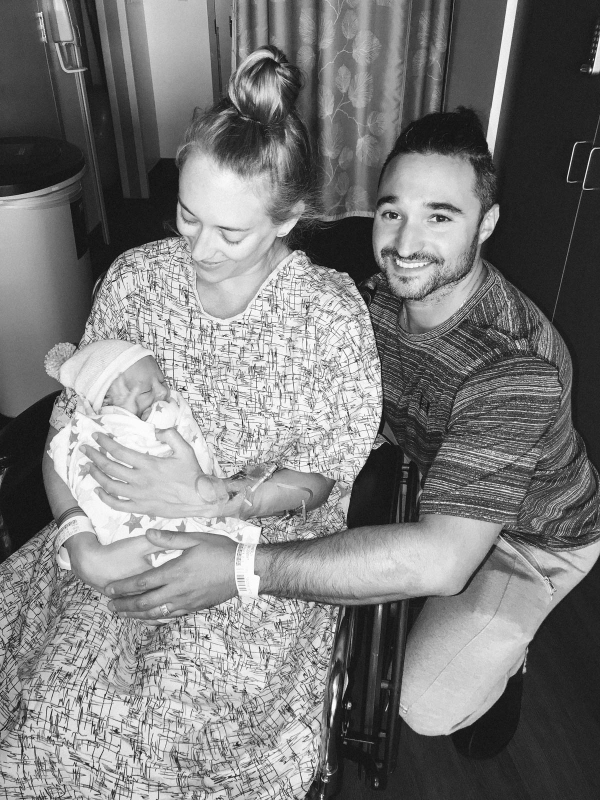 I think we should go to the hospital.” We checked my app and we were pretty close to it being an hour of 4-6 minute apart contractions and at this point, I was not able to talk through them and I was leaning up against all my furniture… it was time to go. I decided to take another shower to get myself together. I wanted to be EXTRA sure to wait till the last minute to head back. I also realized that I had never had dinner and I know once you check into the hospital they won’t allow you to eat. On the way out the door I grabbed a box of wheat thins and tried to force some down on our drive over. At this point it was midnight, the roads were empty and we both hoped this would be our last drive to the hospital. We grabbed my labor bag and headed into the hospital. This time, I could barely walk and was gripping the hand rails in the parking garage elevator. I was moving SLOW and I was in so much pain and discomfort. We checked in at OB triage and by the looks of me… they admitted me into a room right away to be evaluated. She hooked me up to all the machines and did my cervix check. I WAS DILATED 5.5 CMS!!!!!!!!!!!!!! The minute she said that, I blurted out, “DOES THAT MEAN WE CAN STAY?!? !” And she laughed and said, “You are not leaving.” I told her she was now my favorite person in the whole world. Since I tested group b strep positive, I needed to start iv antibiotics to protect the baby during birth. So she quickly got ready to set up my IV which went off without a hitch. She even mentioned how hydrated I was and that she was impressed as the temperatures had been pretty hot the past week and she had seen a lot of dehydrated mamas. I knew chugging water during early labor would pay off!! She got my antibiotic started as well as some pain relief in my IV. This woman was now my hero. I noticed that I also instantly felt like I was having reflux. My throat was starting to burn but the nurse assured me it was all perfectly normally. I was transferred from the bed to a wheelchair and they wheeled me over to Labor and Delivery. They rolled me into the room and I got onto the bed and I instantly felt nauseous. A few seconds later I threw up ALL over the floor next to the bed. Not sure if it was the pain meds, the motion, the reflux, something set me off and after throwing up I did feel better. I was able to get an epidural right away and this was one thing I knew I was open to. YES EPIDURAL PLEASE. I have to be honest, the process of getting the epidural TERRIFIED me. I was also shaking so bad during my contractions and I was so worried about sitting still through the procedure. The anesthesiologist came in and was amazing. He was so kind and explained exactly what he was doing, what I needed to do and was so fast. I sat on the edge of the bed hugging a pillow and focused on my breathing and holding still. He first numbed the area of the epidural and then inserted it. I barely felt anything and before I knew it, he was done. God bless that man. Within about 15 minutes, I could feel the epidural working. The nurse described it would feel like a sensation of ants crawling all over me. She was dead on. I could still somewhat move my legs but once the epidural kicked in, I was feeling amazing. I no longer felt the contractions and the nurse suggested we get some rest to prepare for the pushing ahead. She put me on pitocin to strengthen my contractions which would in turn work to help dilate me and prepare me to give birth. To be able to get this rest was HUGE since I had basically been awake for 24 hours already. I have to say, alot of my experience at the hospital was all very calm. Despite being anxious about getting the epidural and actually birthing the baby, I feel like the whole time I was relatively very calm. I will speak more this later. The nurse told us to get our rest and Blake and I both tried to sleep while we waited on the medications to do their work. The nurses kept turning me side to side throughout the night to make sure the epidural was also equally distributing down both sides of my body. The nurse came back to do my cervix check and we had great news: I was 10 cm dilated and we would prep things to get ready to push soon. In the meantime, Blake had set up our bluetooth speaker and started playing Summer Salt, Driving to Hawaii album which was my zen chill album of my pregnancy. The songs always relax me so much. We alternated between that and Otis Redding because… obviously I have a little thing for Otis Redding. Hence our baby boy’s name. I put my glasses away and put in my contacts so that I could concentrate and my glasses would not sweat off my face while I was pushing. The room slowly started to transform, with an additional nurse coming in, setting up my bed with stirrups for delivery and it was all kind of coming together in the most calm way imaginable. My nurse even offered me some gatorade to power up for the big show. This was amazing after really not having eaten dinner at all. It was all happening. My nurse started explaining what we were going to do together. I was going to practice pushing and she was going to help me know I was using the right muscles to push since I still had my epidural going. She would guide me to take a cleansing breath before the contraction then take a deep breath, and HOLD IT while pushing and we would do this 3 times during each contraction. Since I have asthma, they gave me an oxygen mask in between each contractions to make sure I didn’t get too out of breath or hyperventilate. Our nurse was incredible. So calm and helped each step of the way. She casually told me how we would do some practice pushes and honestly the whole process was so peaceful. I know this sounds CRAZY but the whole process was strangely calm. Blake was even surprised at how mellow, cool, and calm I was during the whole process. The nurse explained that some people end up pushing for up to 2 hours so it was a little bit hard for me to gauge just how long I would have to be doing this. Also it was hard not being able to feel much and know that I was making any progress. The nurse was my cheerleader but I would keep asking Blake if we were REALLY making progress or if she was just being overly optimistic. She did offer me to use a mirror which I swore in the past I would never want to use, but in that moment, I wanted confirmation that was I was doing was progressing. Once I started using the mirror, I could really see my own progress. I can’t tell you how helpful this was to keep going and push through. Pun intended. I could actually see the baby’s head and it was giving me the motivation to keep going. Wildest thing to do an see. So unbelievable. Blake and the nurses continued to help coach me through. The nurse said to me, I think this baby is going to come before 10:30 and she was right! Before I knew it, the nurse was calling the doctor in to prepare for birth. HOLY crap. I knew since the doctor was coming we were so so close. The moment the doctor came in they moved the mirror to make room for her and I never had it readjusted. Once his head was crowning I started to feel a lot of pressure. I knew we were getting close and all of a sudden the doctor said, “His head is out!” The umbilical cord was wrapped around his head so doctor worked quickly to free him. All of a sudden, before I even knew that I had pushed him out completely, they were laying our sweet baby on my chest. I was in complete and utter shock. 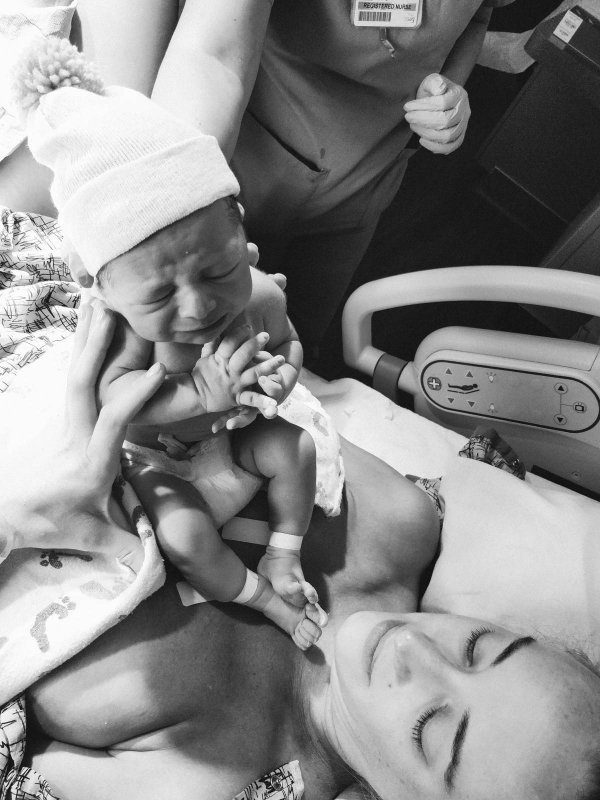 Not only was it so unbelievable that in an instant, he had made this way into the world, I was finally a mother. Tears. Shock. Joy. I can’t describe that first moment. Blake could see it in my eyes. It was so shockingly beautiful. We were finally a family. So after 45 minutes of pushing, Otis Maarten Lapides came into the world at 10:27am weighing 7 lbs and measuring 19.74 inches. We spent the next hour soaking up skin to skin time with Otis. In the meantime my doctor helped deliver the placenta and since I tore a little bit, I had to get a few stitches. Blake also cut the cord before it was clamped as well. 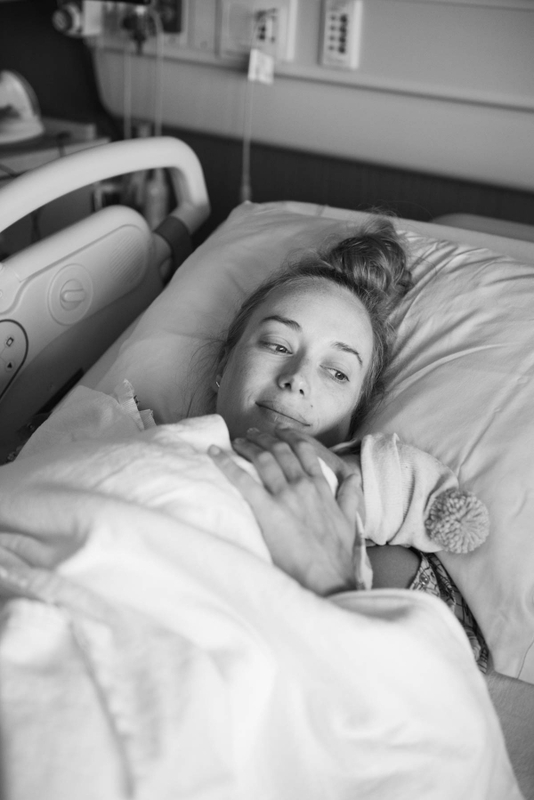 When it came to labor, there were so many things I was scared about leading up to that day. So many questions as to how it would happen, when it would happen etc etc. But in the end, I was stronger than I could have ever imagined looking back on that day. I went into this pregnancy with an open mind and heart after everything we had been through and I decided to go into labor the same way. I put my trust in my doctor, in my nurses, in the hospital, in Blake and most importantly, in myself. Friday was such a tough day for me, testing me in so many ways physically and emotionally and I have to say, my experience at the hospital was nothing but amazing. 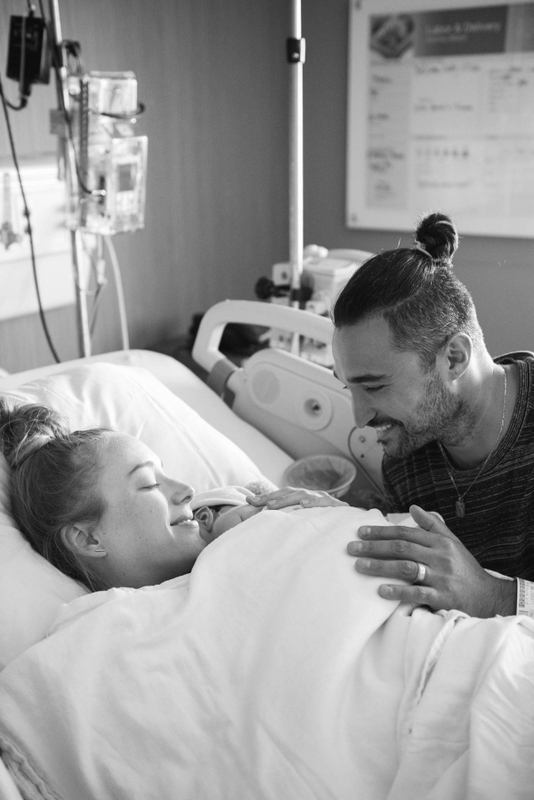 My attitude was to be as go with the flow as possible to do what was best for my baby to enter this world and it warms my heart to have been able to have such a beautiful experience. Don’t get me wrong, it was all hard and came with so many challenges, but I can’t imagine it have happened any other way. Before I knew it, we were whisked away into our recover room with our little clear bassinet with Otis looking right us. My epidural was taken out and so slowly but sure all feeling was coming back and that included the lady bits pain. Recovery from a vaginal birth is some messy business. A bloody mess to be exact. Basically every time you go to the bathroom, you are changing out your bulky pads in your mesh underwear. Blood is dripping on the floor, the pads are falling all over the place, your using a spray bottle to clean your lady area. It’s a lot. You are also scared shitless to touch your stitches or disturb anything after birth. But it’s all just part of it. I know that all sounds very unpleasant but it’s just the reality of the recovery. It’s tough and messy. Luckily I have a rockstar of a husband who wins Dad of the Year award and he instantly took over changing every single diaper in the hospital and taking charge to help bring me the baby when I needed to rest. When we first got up into the room, I tried immediately to breastfeed with the help of my nurse. Luckily we delivered at a hospital who is very breastfeeding friends and every nurse is educated in lactation. Otis latched immediately and it was such a relief to know that 1. I had milk to give and 2. I could do it! WILD. We ended up spending 2 nights of recovery in the hospital. By the time our discharge time came, we were ready to do this. Ready to bring our family home and start our life together. From the bottom of my heart, I have to thank you all for following our journey, for supporting us, and for listening to the story we had to tell. The sweet notes from close friends, readers, family expressing their joy after our long fight with IVF… it’s been incredibly emotional to feel so lucky to be on the other end of all that darkness. Otis is our dream come true. Our little miracle. There will never be a day I take that for granted. So as we continue to share our lives with you all, little Otis will be joining in on the adventure and my heart will only to continue to grow everyday with him. Otis, we love you more than words and you have changed our lives forever. nat - Oh wow, it was actually so intriguing to read how the days went. I’m surprised that the epidural was so pain free because it looks so scary. I’m so glad to read that everything went well! 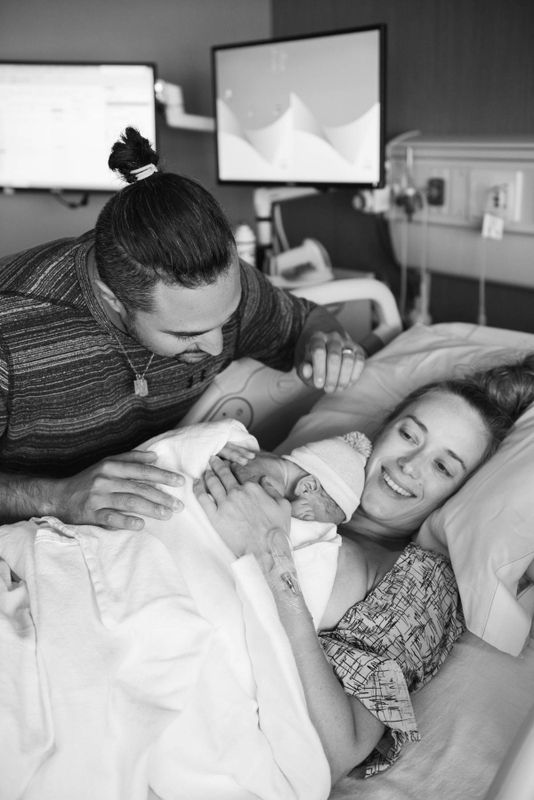 Margarita - Thank you so much for sharing your birth story. It’s beautifully written. So happy for you and Blake, wishing you all the love and happiness, you both have been through so much. 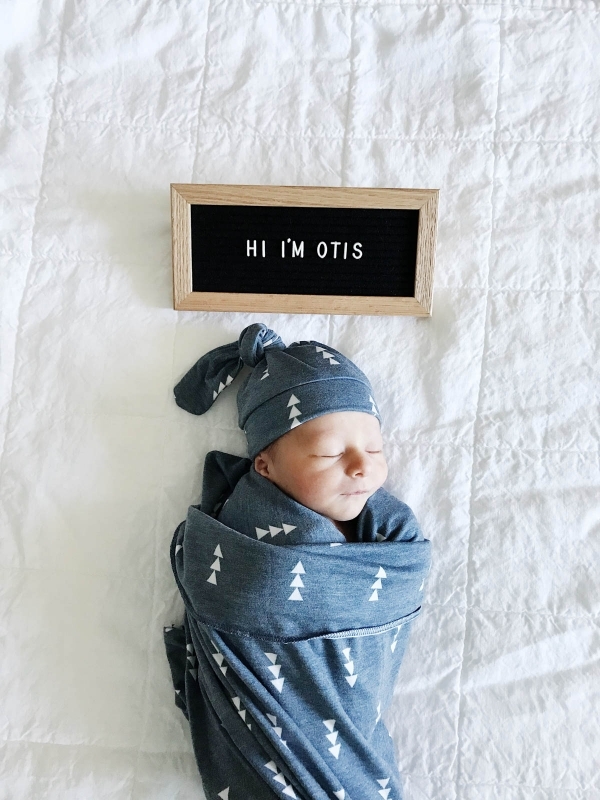 Welcome to the world Sweet Otis, you are so loved!!! Reham al sarawi - Congratulations for your first new baby, hope otis will grow in good health sorounded with love and joy in your hands and his father as well as your family. I just want to express my feelings, otis is so cute he looks like you. As a mother of 5 i want to tell you that your full joy will be completed more when you see otis is growing and saying mama baba then standing next to you as a strong adult boy graduating from school heading to a new life experiencing his new journey, share every moment with him let him speack and expresses his fealings and most of all take easily and step by step.